Award-winning chef David Burke takes Modern American cuisine to a new level! David Burke, executive chef and co-owner of his namesake restaurant, davidburke & donatella, has been intriguing diners for years with his innovative approach to cooking. With his solid culinary training from the prestigious CIA (Culinary Institute of America in New York), impressive credentials working with such highly regarded chefs as: Charlie Palmer at the River Café, Waldy Maldouf at La Cremaillere, studying the art of pastry with Pierre Troisgros and Georges Blanc in France, as well as working with Smith & Wollensky and the Park Avenue Café, he was well prepared when he opened his restaurant on December 23, 2003 with Donatella Arpaia in a fashionable East Side townhouse. I have been watching David’s career ever since I received his 1995 cookbook, Cooking with David Burke of the Park Avenue Café, (Alfred A. Knopf publishers) as a gift. I eagerly cheered each time this creative chef won another award, and there have been many: he was the youngest chef and the first American to receive France’s Ouviers de France Diplome d’Honneur at the age of 26, won Japan’s Nippon Award of Excellence, received a James Beard nomination in 1995, followed by the Robert Mondavi Award of Excellence in 1996, was one of the first Americans to receive the CIA’s August Escoffier Award, won Nation’s Restaurant News’ 50 Top R&D Culinarians, and in March 2005, he was “Selected as one of the finest chefs worldwide” by the American Academy of Hospitality Sciences when he received their prestigious Star Diamond Award. Enough said, this man can cook! On July 15, 2005, Edward F. Nesta and I had dinner at davidburke & donatella, and were impressed with the food, the service and the ambience. David Burke and Donatella Arpaia’s creativity doesn’t stop at the kitchen; the townhouse has a charming atmosphere with some very whimsical touches. 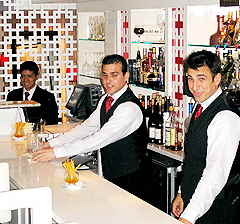 From the minute we walked down the steps into the restaurant, we were greeted with a warm reception from Jennifer at the Reception Desk, Christopher Roman, the Maitre’D, and from the bartenders, Thomas Barone and Raafet Olian, who greeted each restaurant guest with the same enthusiasm. As the bar filled up with regulars, including Charles Ciolino, as well as newcomers, the bar patrons were treated with tempting tidbits to sample including Pastrami Salmon served in a soba noodle roll. Seated in the second dining room on a wraparound red upholstered banquette, we had the perfect view of the room, which has high ceilings graced by a chandelier topped with red lampshades, 2 large urns on either side of the room were filled with massive floral arrangements of ferns, lilies in a riot of color, curly willow and other exotica, large mirrors on either side of the urns were adorned with red Roman shades to soften the room, and bring the height into balance. Over the large white fireplace surrounded with black marble, there was a large contemporary glass sculpture that looked like red stalagmites, and on the opposite wall, there were colorful glass “balloons” and an assortment of penguin pitchers sitting on a shelf. Wall sconces with red lampshades completed the ambience, with white linen draped tables with red leather chairs, and an interesting carpet of gray and black squares within squares design. James, our waiter, began our evening with Brioche and Sourdough Parkerhouse rolls served in miniature copper pots, that were brushed with zatter butter and garnished with rosemary, and an Amuse Bouche of Goat Cheese Fondue with Jalapeno Peach Marmalade served on an Asian spoon, which was the start of our Tasting Menu. We also added a few extras, which included the Sashimi Style Yellowfin Tuna on Himalayan Rock Salt served with Fisherman’s Toast and XO sauce in a glass bowl topped with a monkey, because David likes to have a bit of fun with his presentations. The tuna was simplicity itself, but when combined with the XO sauce, it was fabulous. James also brought curried pommes, which were curried flavored potato crisps that were delicately flavored and airy, and served in a miniature chef toque. The wine pairing began with a California 2004 J Pinot Gris from the Russian River Valley, which had a fruity balanced nose of peach and citrus, with citrus and acidity on the palate, which complemented the spice of the XO sauce, and continued to work well with the Rumson Style Surf and Turf, which was lobster hash sautéed with sauterne over a savory lobster flan, and foie gras over a caramelized onion flan with sherry vinegar, honey and raisins, both served in eggshells, in whimsical pewter clown face eggcups, which could be turned to reflect either happy or sad face clowns. When we finished, we turned the clown faces to the sad side because we were finished with this tempting first course. We stayed with the same wine for our second course of Scottish Langoustine with honey truffle vinaigrette and a Maryland crabmeat spring roll that had a crispy exterior and a delectable filling of crabmeat. Our third course was Tempura Soft Shell Crab served over seedless watermelon and the season’s first heirloom tomatoes, and although I am not a fan of soft shell crab, Edward did them both justice. 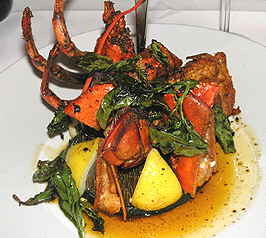 The 2001 Joseph Drouhin Puligny Montrachet, was an aromatic French white burgundy wine with a floral and fruit nose, rich, aromatic full bodied, balanced with a delicious creaminess on the palate, which was a nice pairing with the soft shell crabs which were dusted with madras curry. We did take a break from tasting to chat with the guests at neighboring tables seated on the wraparound banquettes, as we compared each of our courses, including guests from Naples, Florida who also had the Tasting Menu, and another couple from Connecticut who raved about the BBQ Calves Liver and Warm Asparagus, but the appetizer that I definitely want to try on my next visit is the Crisp and Angry Lobster Cocktail that I watched go by with great longing. For our fourth course, Edward had the Aussie Lamb Chops with a lobster and golden chanterelle risotto with Jersey sweet corn and “Beautiful Day” sauce, which was a veal demi-glaze sauce made with green peppercorns, tomato fondue and brunoise vegetables, that had him sighing with pleasure, accompanied by a Sicilian 2003 Sedàra from Donnafugata, a dry wine with long legs and with tobacco on the nose and on the palate, made from 100% Neo d’Avola grapes. My Mustard Crusted Tuna “Teriyaki” with soba noodle nori roll, spicy tuna sticks and tapioca sauce was paired with a 2002 Markham Pinot Noir that was big, bold, heavy with tannins, and so dry that it made my mouth pucker, which is how I like my wines. 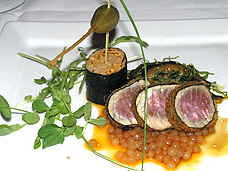 The tuna was 3 perfect tender medallions and the roll was an enticing blend of textures and spices. Our final course of Dessert consisted of Warm & Crisp Apple Tart with green apple confit, cider caramel and cinnamon ice cream, and Butterscotch Panna Cotta with curried cocoa gelée and madras curry meringue “cigarettes”. 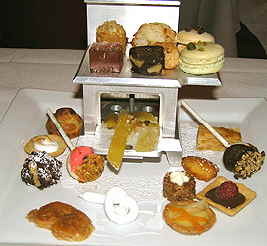 We sampled both of the desserts, and when we thought it couldn’t get any better, lo and behold, James came by with a miniature silver stove that held an assortment of petit fours including the famous cheesecake lollipops from David Burke’s Cheesecake Lollipop Tree, which was accompanied by bubblegum whipped cream, lemon tarts, French macarons, coconut macaroons, meringue love knots, madeleines, chocolate tarts, palmiers, and candied fruit rested on the open stove door. Although the Warm & Crisp Tart and Butterscotch Panna Cotta would certainly have been enough, we had to sample a few of the Petit Fours, followed by espressos. We look forward to returning to davidburke & donatella to sample the rest of his creative dinner menu, as well his prix fixe lunch and brunch menus. 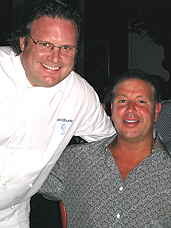 I also had the opportunity to meet with David and learn more about this creative chef, who is a frequent guest on many television programs including recently where Al Roker was taping a show for the TV Food Network, and CNBC had filmed David at his home for their outdoor grilling segment, where he made a clambake on the grill. In addition to his restaurant, foodies will rejoice to know that he is expanding his culinary repertoire to Chicago where he will open Burke’s Steakhouse, as well as one in New York, and in April 2006, he will open David Burke at the Venetian in Las Vegas. In his “free time” he gets his inspiration from traveling, reading, dreaming, and always pushing. He likes to hang with his kids, travel and “do what I do. When I need a day off, I take a day off.” You can’t be afraid to fall, and while some people like to play it safe, he likes to push the envelope. As we chatted, the busy restaurant was filled to capacity with friends and regulars who came by to say hello to him. It seems that he is like a charming pied piper who keeps his guests returning. I asked him about his fanciful décor including the miniature stoves, which he said originally were antique stove salesman’s samples. As they became harder to find, he had a company custom design them for him, as well as many other items in the restaurant. A large brass Humpty Dumpty with a humorous expression and a cigarette sits on a fireplace mantle surrounded by other miniature versions, where hand-cut Himalayan salt glows like embers in the fireplace. David told me that his restaurant in Las Vegas is going to have a salt “brick wall” for Humpty Dumpty to sit on! When I told him that he was going to set Las Vegas on its ear, he replied, “I hope so!” He also said that he really developed his creativity while working at the River Café, where he had to compete with the spectacular views. He felt that he wanted people to come for the food, not just the views. I think he has succeeded. 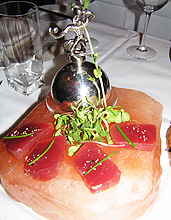 Read Chefs' Recipes where David’s his recipe for Parfait of Salmon and Tuna Tartars with Crème Fraiche, and other articles on David in Award Winning Menu and The American Academy of Hospitality Sciences Star Diamond Awards 2005. Read more about New York in the Destination, Restaurants, Chefs’ Recipes, Gastronomy, Arts & Antiques, Music Scene and Wine Cellar sections. © August 2005. Luxury Experience. www.luxuryexperience.com All rights reserved.